It’s countdown to Election 2017, with less than three weeks to go before we cast our vote! Tax is on our minds at NZCCSS. Executive Officer, Trevor McGlinchey, has called for fairer tax policies to fund the incredible work undertaken by hundreds of community-based organisations around the country. Housing is another key election issue for our member agencies. The latest report from the Salvation Army Taking Stock 2017 is a timely reminder to all our political parties to build more social housing for families in low-income households. The report says 2,000 to 2,500 social home need to be build if we are to provide families with stable, quality and healthy homes. NZCCSS social service members see all too often the impact of homelessness and substandard housing on family and whānau. In a NZCCSS media statement supporting the report Trevor McGlinchey days “On my regular visits to our members, homelessness and poverty caused by high rental costs and low incomes is regularly cited as the key drivers of ill-health, mental stress and low levels of educational achievement”. Our church communities are giving us hope housing solutions will be found sooner rather than later. 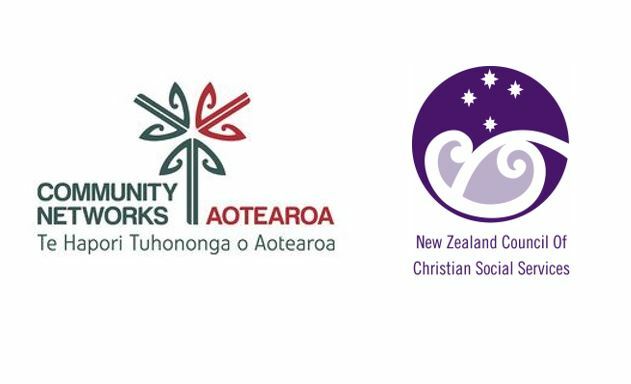 At a recent election forum co-hosted by the Anglican and Catholic over 600 people in Wellington turned out to hear from people affected by the housing shortages and from electoral candidates on what solutions they propose. A ‘courageous vision’ to turn the housing crisis into a housing opportunity is one message to politicians from Kate Day, an advocate from the Anglican Diocese of Wellington. The Equality Network is asking for politicians to commit to a truly free education, which will benefit all children. 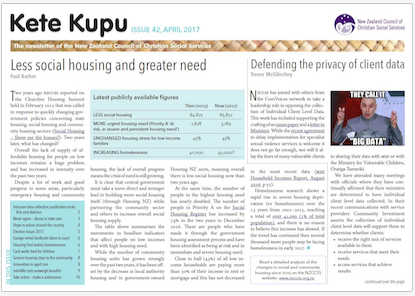 Hui E Community Election 2017 Report is out. The report identifies community-wide issues while offering solutions put forward by those working at the coalface. A must read for all politicians. This Conference is important for all those in your organisation who will be involved in planning for the future, your governance, your management and your senior staff. It will provide key strategic information to support your planning for success. SPECIAL SCHOLARSHIPS AVAILABLE: – There are 10 fully funded scholarships (thanks to JR McKenzie Trust) for the full registration price for delegates from small organisations. See here for information. Parliament has now been dissolved until the result of election 2017 but there are some updates to keep you posted on. The Social Workers registration Legislation Bill – The Bill was tabled on 9th August and had its first reading on 17 August. Already concerns have been raised about the how the bill defines social work. The core issue of contention is around the proposal to allow employers to define the title ‘social work’ . NZCCSS is currently working through the bill and will consult with members on the proposals contained in Bill. Watch this space for further updates. Making Working for Families and child support simpler – Inland Revenue is consulting on ways to simplify entitlements the department administers [Working for families Tax credit, child support, student loan repayments and Kiwisaver]. NZCCSS is currently working on a submission and has started a consultation process. Consultation closes on September 15 2017. NZCCSS is currently working on a submission and has started a consultation process. We will keep members informed. If you are interested in how well newly graduated Social Workers are prepared for their roles please have a look at the enhance R2P project funded by Ako Aotearoa National Centre for Tertiary Teaching Excellence. They are asking for your feedback on the level of preparedness of newly qualified social workers. Your feedback will be greatly appreciated. For further information click on the webpage. Note both surveys will close on 15th September 2017 so you’ll need to be quick if you wish to participate. 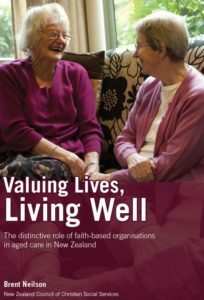 The challenges facing resthomes – Kathryn Ryan interviews David Hanna from Wesley Community Action in Wellington about by the Wesleyhaven Village in Naenae has just closed, and Esther Perriam from Eldernet, about the challenges facing resthomes. Well worth a listen! The Last word goes to …….